AR is a computer program that helps teachers manage and monitor children’s independent reading practice. Your child picks a book at his/her own level and reads it at his/her own pace. When finished, your child takes a short quiz on the computer - passing the quiz is an indication that your child has understood what has been read. AR gives both children and teachers feedback based on the quiz results which the teacher then uses to help the child set targets and ongoing reading practice. 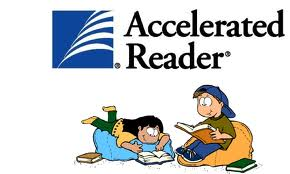 At Salisbury Road Primary School Accelerated Reader is used throughout Key Stage 2 (years 3-6) However, some Year 1 and 2 children will use it as we progress through the year. All children throughout the school will need to have their reading books in school every day alongside their reading record books where they will record their progress and targets. It is essential for the success of the scheme that we have your support on this matter and it will be very much appreciated. If books are lost please let us know as soon as possible. Please follow the link below to the AR parent's guide for more information.